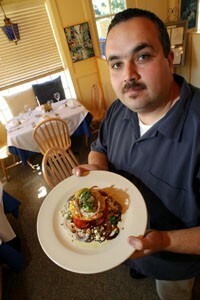 Song of the Siren: Bistro Allure's chef and co-owner William Azevedo shows off his heirloom tomato salad. It's taken a while to get around to reviewing Santa Rosa's Bistro Allure. It's always been "the restaurant we'd like to get around to trying out" but never were able, probably because I am forgetful and easily distracted. So Bistro Allure waited patiently, and we kept remembering and then forgetting it. In the meantime, it moved across town to Fourth Street into what was, for 20-plus years, Cafe des Croissants. Chef-proprietor William Azevedo (brother of Manuel Azevedo, chef of Sonoma's La Salette) and his wife Allison, who manages front-of-the-house matters, retained the croissant business in the morning and recently expanded their hours to include lunch, so you could eat three meals a day there. Azevedo cut his teeth working at various locations in Sonoma Valley, including Elaine Bell Catering, the Swiss Hotel, Sonoma Hotel, and La Salette. By moving from its Bennett Valley location (now Govinda's vegetarian buffet), Bistro Allure lost some tables but gained a charming boutique feel from the diminutive size of the new venue, which has maybe a dozen tables in its creamy-walled dining room. It's also (except, presumably, for those who live and work in Bennett Valley) a lot more accessible, which is fortunate, because Bistro Allure deserves a visit. On a Wednesday night, the dining room was impressively close to being full ("full" being a maximum occupancy of 38). The tables are smallish and the quarters are close, but there was a soothing, quiet air to the place, enhanced by the glow of amber lamps illuminating the white tablecloths. I got a caesar salad ($5.75). After eating at nice restaurants over and over again, you'd figure one would tire of caesar salads. Never! Some very ambitious food writer with a lot of gas money to burn could tour America by sampling the caesar salads at nice restaurants and structure a whole book around it. You could even call it American Caesar: Life and Lettuce at America's Nice Restaurants. I'm not going to write that book--but I will gladly be the person who always orders a caesar salad when eating out. Bistro Allure's was substantial, cool and crisp and in a subtle dressing; shreds of parmesan cheese dotted the top. There's an option to order it with Spanish anchovies ($1.25 extra), which I found myself wishing I had chosen just for pep. Amie du Jour and I had a tough time choosing first courses; they all looked tempting, especially the wild boar tostada ($8.75). Amie du Jour settled on the baked salt cod fritters ($8.75), which were the best of both worlds: salty, flaky cod, warm and garlicky, but much lighter than typical bacalhau dishes. A zippy anchovy dressing underscored the whole affair. There was also a large dab of lemon-cilantro aioli in the center of the plate, which was fine, though it was somewhat ignored in favor of the tangy anchovy dressing. Amie du Jour's glass of Adler Fels 2000 Fumé Blanc ($6.75) was crisp and aromatic, with appealing citrus notes, but I went nuts over the Toad Hollow 2002 Dry Pinot Noir Rosé ($6). Some hot afternoon when I have a whole day to waste, I'm going to buy a bottle of this light-bodied, easy-drinking stuff and put back the whole thing. Selecting second courses was also tough: pork tenderloin with a cider reduction and prosciutto and yam croquettes, sea bass crusted with crushed toasted fava beans . . . At the last minute, I switched my decision from the pork tenderloin to the spice-rubbed grouper ($17.75), a splashy dish on a bed of creamy corn and rhubarb succotash topped with a colorful salsa of fruit and nopales. The grouper itself was delicately breaded and nicely crisp, while its flesh was moist. Very satisfying, and perhaps a dish that would be too busy in the hands of a lesser chef. For reasons that escape me now, when ordering wine to go with the entrée, I forgot that I had ordered the grouper instead of the pork tenderloin, and got the Primavera Vinho Tinto 1999 ($6 glass), thinking it would be lovely with pork. And yes, the soft but rich Vinho Tinto would have been perfect with pork, but not so much the grouper. Doh! The hanger steak with gorgonzola mashed potatoes ($17.75) suffered from an overly hearty does of gorgonzola, whose pungency managed to elbow out the other flavors going on, particularly the caramelized garlic-mushroom reduction. Even for the two gorgonzola lovers at the table it was distracting. But the steak was cooked a perfect medium-rare, and the potatoes were pleasantly chunky. The wax and green beans on the side were a little undercooked and grassy-tasting. Amie du Jour's Saintsbury 2001 Pinot Noir ($6.75 glass) was fabulous, jammy and acidic with a slightly prickly finish. We split the espresso crème brûlée ($5.75)--the trusty caesar salad of desserts. It was definitely big enough to share, and its amber sugar crust was so freshly caramelized that we decided to pause our destruction of it for a moment to allow it to crisp up all the way. No matter. Dessert is not for rushing through, and I'd rather have a too-fresh caramel burnt sugar on my brûlée than a rubbery old one. Our service was extremely attentive and cordial, but not fawning. Plus our servers were all handsome young men, a nice bonus. As for those croissants sold in the morning, they seem pretty good. Since croissants are one of the three foods I'm not fond of (the other two being oysters and most pears--it's a texture thing), I cheated and tried an almond-filled croissant instead of a plain one. Even a nonfan of croissants should be able to detect badly made ones, however, and it's obvious that Bistro Allure's rendition of Cafe des Croissants' recipe is far beyond passable. But you croissant lovers are on your own here. I can vouch that the cappuccino I had was excellent. It's interesting to visit Bistro Allure in the morning (some older folks linger at the tables, reading their morning papers and nibbling their croissants as they've probably done for years) and compare the fresh slant of the light playing on its walls to the dimmer, more--well, alluring--space it becomes after sunset. Bistro Allure has a sincerity to it--the food and the atmosphere--that's very welcoming, making it easier to embrace than other, sleeker fine restaurants in the North Bay. Which is why I'll recommend it to visitors to Santa Rosa in a heartbeat, and why it's probable that Bistro Allure won't stay under the radar for too long. Bistro Allure. 1226 Fourth St., Santa Rosa. Breakfast daily, 6am-11:30am; lunch, Tuesday-Friday, 11:30am-2pm; dinner, Tuesday-Saturday, 5pm-9pm. 707.569.8222. From the September 25-October 1, 2003 issue of the North Bay Bohemian.